Ukraine’s capital, Kiev, has been racked by protests, the largest since the 2004 Orange Revolution when the country rose up in response to fraudulent presidential elections. Thousands of people have been occupying Kiev’s main square since last November and more recently, government buildings. The varying reports on the reasons for the violence and the range of people taking part – from the young and the old to the liberal and the far-right – show the complexity of the situation; this also means it’s easy to fall prey to misconceptions. Is the driving force behind the protests the wide discontent with government corruption? Or is the conflict between those who want to forge closer ties with Russia, reminiscent of Soviet times, versus those who want closer integration with the European Union? Or both and more? President Viktor Yanukovych’s abrupt rejection of a deal for closer integration with the EU on November 21 triggered the protests. The decision came after toying with the idea of a European partnership for more than a year, and was taken to mean more than just a trade deal. Symbolically, his choice was interpreted as a desire to turn away from the EU and move closer to Russia, and was quickly followed by a US$15-billion offer of credits and cheap gas from Russia, possibly as a reward. Many of those who filled the streets were in favour of closer ties with the EU. However, as the crisis evolves it is becoming apparent that the protestors are increasingly redirecting their frustration towards the country’s corrupt political system and police. It has been said that the protestors are determined to force the president to step down and end what they allege is a corrupt regime. What do the people really need? The government’s attempt to subdue the turmoil by offering to install opposition leaders and a reshuffling of the Cabinet have largely failed. So what is needed to meet the demands of the people? One that has been highlighted by Transparency International Ukraine, in addition to the president’s resignation, is the need for constitutional change, as the current one gives the president too much power. This creates a fertile breeding ground for corruption. This may seem like a long shot as constitutions can be extremely difficult to change. Ukraine though, is in a unique position. The constitution that was formed in 1996 was amended to fix “technical errors” during the 2004 Orange Revolution to shift the balance of power away from the president to parliament, which suggests the same can happen now. Whether this is something that will happen in the near future remains unseen, as there are many who support the current government’s regime, especially those who favour closer ties with Russia. With the protests turning violent, a major concern is the safety of civil society organisations and journalists reporting on the events. It is also a dangerous time to be reporting on corruption for Transparency International Ukraine – which the government has included in its list of “dangerous institutions”. The government has been trying to discredit the chapter to stop it reporting on corrupt Ukrainian officials. Some news outlets and protestors have shown the police as indiscriminately using tear gas and flash grenades, and beating people with truncheons in areas where the protests are taking place. The brutality of the police was captured on film by a number of protestors and journalists (The Telegraph, Global Voices). The frustration and anger felt towards the police is not new in Ukraine – the police lost their legitimacy long ago because of their perceived corrupt practices and documented human rights abuses shown by the 20 to 40 people, on average, dying each year in Ukrainian police stations. In fact, in research done last year, Transparency International found that the police and judiciary were considered by the Ukrainian people to be the country’s most corrupt institutions. 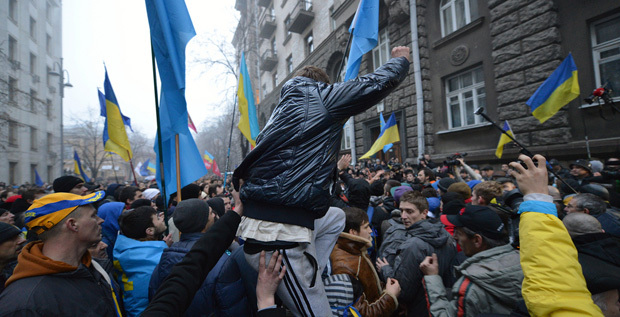 Transparency International Ukraine hopes the crisis will be resolved soon. One of the key elements of solving the crisis, beside the resumption of the 2004 version of the Constitution and the appointment of a technocrat government, is the immediate implementation of a set of reforms. Civil society is already working on reforms, including anti-corruption, administrative, state service, judiciary, prosecution and police modifications. Should Ukrainian society and authorities choose this way of resolving the conflict, the country will witness quick improvements that would lead to Ukraine’s returning to the European family. However, there is a different scenario threatening bloodshed and a new ruin – a terrible period of Ukrainian history characterised by continuous strife, civil war, and complete loss of independence in the 17th – 18th centuries. Unfortunately, not all depends on Ukrainians themselves. They need European governments to support Ukrainians’ aspiration to live in a country with values that are common with European ones – a country ruled in accordance with human rights, democracy and law instead of corruption and injustice.